Vendors stand in front of their art exhibit at the art langar festival in Islamabad, Pakistan. Photo by Annam Lodhi, used with permission. Islamabad is a city that loves order. Traffic in Pakistan’s capital city is usually light and streets are barren after 9 p.m. Yet, the past month or so has been unusually chaotic for the city and its twin, Rawalpindi, just down the road. Members of religious political groups staged a month-long sit-in leading to heightened security and clashes with protestors. The main entrance to the city was blocked during the protests, as were connecting roads between the twin cities. Needless to say, the political unrest in the city disoriented the lives of many. But a recent music festival called Art Langar has brought back joy at a time of political unrest. “We are used to it,” said Nawal Mannan, an architecture student who was attending the event, which took place on the first weekend of December in Islamabad. Art Langar was inspired by the Sufi urs festival, usually held at shrines to mark the anniversary of the passing of a Sufi saint, and celebrated by devotees with music, poetry and food. Sab ka bhala Sab ki khair, or goodwill and good tidings to all, is its slogan. The concept behind Art Langar is to give back to people. “The whole idea is food for the hungry, be it the soul, heart or your stomach,” said Arieb Azhar, a Pakistani musician and the man behind the show. 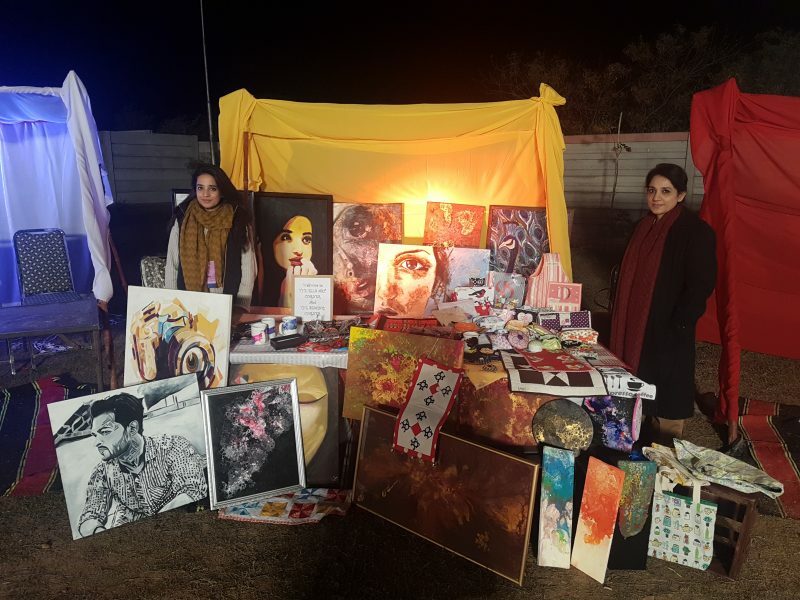 The festival was filled with art installations by art students from various national universities, stalls that sold crafts from all over Pakistan, and food stalls. A bonfire and a stage for music to rock the night sat at the heart of it all. The festival was attended by over four thousand people from all ages and walks of life. People danced the evening away, a refreshing break from the previous week’s upheaval and unrest, but the event wasn’t easy to put together. “Because of the political unrest people do buy tickets in advance. They wait until the very last minute to see if things are okay,” said Arieb Azhar. Azhar was about to the call the event off as the situation of the city was unstable just a few days before the event, but decided against it. “My team pushed me to carry on with the event citing that this is what the city needs at the moment,” he explained. 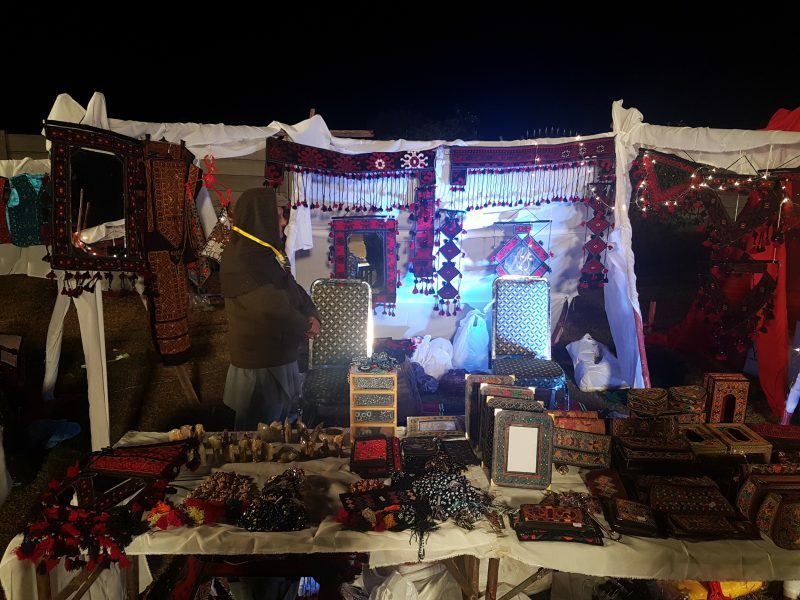 An exhibit with beautiful traditional ethic embroidery at Art Langar festival, Islamabad. Photo by Annam Lodhi. The thousands of young people who attended the festival agreed. “Such events are very important, they help create a social life and allows us to relax,” said Laiba, who was showcasing her artwork. Tickets for Art Langar started at Rs. 500 (4.50 U.S. dollars) for students and Rs.1000 (9 U.S. dollars) for the rest, making it easier for students to attend. “If the tickets cost more we have to think twice before attending an event,” said Soha Azeem, a student. There are only a handful of recreational spaces available for the residents of the two cities, such as the Pakistan National Council of Arts (PNCA) and Lok Virsa. However, these spaces aren’t adequate, according to Ammar Khalid, a member of Theatre Wallay, an independent theatre company battling for more public spaces for arts. “There is a visible coloration between fall in cultural activities and rise in intolerance in the country,” he said. Events like the Art Langar, which are affordable and safe, are very well received by people but will continue to face challenges due to Pakistan’s unpredictable politics. Previous PostShe Dared to Say Pakistan’s Most Popular Politician Harassed Her. Then Came the Abuse.